Two recent columns of “Your Town and My Town” have been devoted to a review of a quaint old book, “The Old Main Line,” as written by J.W. Townsend 1919. This week’s column will deal with outdoor sports, although they were practically non-existent then as compared to their present day form. “Tennis did not appear until the late 70’s, and although baseball was played in some places it was little known in the suburbs. Cricket came into existence at about this time… the Merion Cricket Club had just been organized. Quoits were played occasionally. “Playing cards were strictly taboo among the Quakers and Presbyterians, who largely predominated in Philadelphia’s social life. Youngsters played parchesi, jackstraws and lotto, while their elders joined in on checkers and backgammon. Billiards and chess were other popular games. In the late 70’s, when Louella House, in Wayne, became a summer hotel for Philadelphians under the name of Louella Mansions, its owners issued a little booklet setting forth its attractions. Its Casino contained shuffle-boards, a pool table and gymnasium apparatus. The mansion itself contained library, smoking and music rooms, orchestral music every Saturday evening with extensive room for dancing. So, even in a decade or two, popular summer hotels of the Main Line began to offer more in the way of amusement than did the boarding house of the ’60’s. “Country summering” was becoming increasingly popular with city folks, as indicated by a small prospectus issued by the railway company in 1874. It listed 54 boarding houses from Overbrook to Downingtown with accommodations for 1,330 “quiet guests,” exclusive of the Bryn Mawr Hotel, which held 250. “The Main Line showed the first symptoms of getting gay,” writes Mr. Townsend, “when the Summit Grove Hotel, in Bryn Mawr, got well under way in the summer of 1873. The Bryn Mawr assemblies were the events of the season, with about 500 people attending each of them. When the Bryn Mawr tract was laid out, its avenues were covered with a coarse gravel, which made for very slow travel. These roads exasperated Mr. Cassatt, vice-president of the railroad who was fond of driving his four-in-hand coach. He accepted the position of Township Road Supervisor and was instrumental in obtaining macadamized roadbeds. He also got a company of his friends to buy Lancaster pike as far as Paoli and to make a macadamized road of it. Toll was charged to keep it in order and “it was a boon” to the driving public for many years. In later years the toll gates were abolished, when the State bought the Pike and maintained it by taxes. Next week’s column continues with more excerpts from Mr. Townsend’s book, in particular concerning the dress of the Main Line men and women in the 60’s. Other matters to be described range from transportation to lightning rods. The July 5 column of “Your Town and My Town” contained a partial review of an old book from the office library of the late J.M. Fronefield. Today’s column continues with the story of social life along the Main Line 80 years and more ago, as it has been described in “The Old Main Line,” written by Joseph W. Townsend in 1919. It was in the 80’s, according to Mr. Townsend, that Philadelphians, seeking to escape the heat of the city’s summer, began to come out west of city line. The Wildgoos boarding house near Haverford College was one of the favorite resorts and one of which Mr. Townsend evidently knew a great deal personally. It was probably very much like Wayne’s Louella Mansion and the Bellevue Hotel, though these two did not reach the height of their popularity until a slightly later date. “Wildgoos boarders were,” according to Mr. Townsend, “a jolly, good-natured crowd, living all summer like one large, happy family. Rooms could be engaged only for the entire summer, and were in such demand that there was always a waiting list.” However, to modern youth, the pleasure of that kind of Main Line summer life would probably seem very dull, with no automobiles, no movies and no sports as young people know them today. Even in Philadelphia itself there were only two or three theatres and these featured neither comic opera nor musical comedies. One favorite evening entertainment consisted of charades, rebuses and conundrums. The latter were most frequently derived from the Bible, as most people were familiar with it. Spirit mysteries were very much in vogue then, as witnessed by the popularity of Planchette, predecessor of the Ouija Board. On Sundays in the 60’s, “church going, walking and visiting were the order of the day. Those who took long drives were often frowned upon by their more religious neighbors. Sunday evenings were mostly spent in hymn singing. There were, of course, no Sunday newspapers. The Pennsylvania Railroad ran but one train and that was from Philadelphia at eight o’clock in the morning. None went into Philadelphia from the suburbs.” Mr. Townsend tells of an early report of a committee of the railway company’s stockholders which devoted five pages to the iniquity of the company’s doing any business on Sunday. 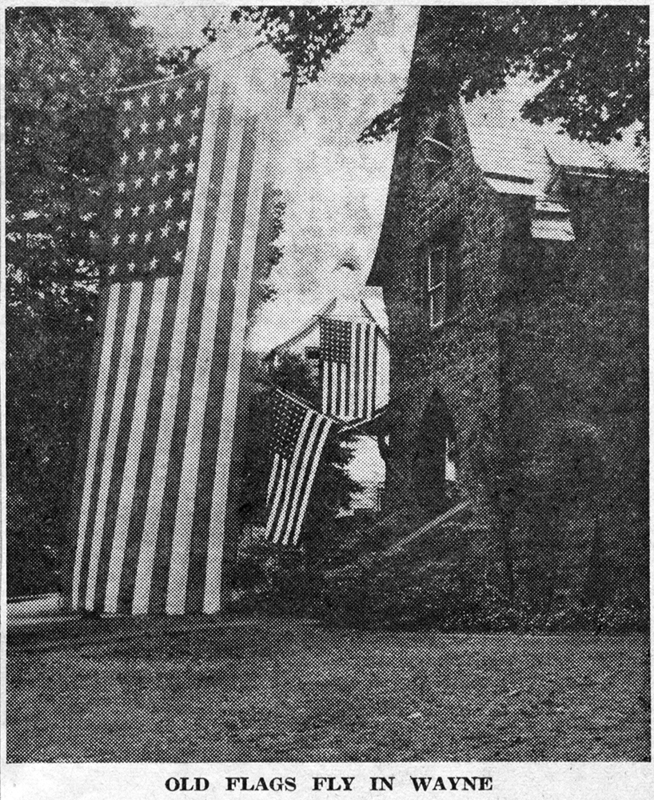 An editorial in “The Suburban” of June 28 once again called the attention of its readers to the fact that “it is only good citizenship to display the flag on our most important national holidays,” and made a plea for a more noteworthy display in our business area on July 4 than had been shown on Memorial Day and Flag Day. Shown in this week’s column is a picture of the great American flag, hung between two old trees in front of the home of Mr. and Mrs. Theodore B. Brooks, on Windermere avenue. Mr. Brooks, with John Brooke, of North Wayne avenue, had put up the 90-year-old flag. Its 34 stars indicate that it was made between 1861 and 1863, since it was in 1861 that Kansas was admitted into the Union as the 34th state, and West Virginia in 1863. This Flag, with its dimensions of 25 by 13 feet, has been borrowed more than once by John Brooke from his aunt, Mrs. Nathan Pechin. It had been one of the cherished possessions of her husband, “Nate,” one of Wayne’s most widely-known citizens up to the time of his death a few years ago. The old flag had come to Mr. Pechin from his uncle, Frank Hoy, who many years ago operated the old King of Prussia Hotel. During most of the years that the family owned the old hostelry, this large flag was displayed from the wide front porch on all national holidays. As the writer watched the old Flag blowing in the breezes on this Fourth, she felt a sense of pleasure that they were gentle ones, for the stars and stripes are frail with age. There are some small holes here and there in the still bright bunting, and it is so transparent that one can see the leaves of the tree beyond it. The excellent photograph shown above was taken by Bruce Redfield, formerly of Wayne. Of the other two flags, the one farther away from the camera is another interesting one, since it displays but 45 stars. That dates it as between July 4, 1896, and November 4, 1908, the date when Utah and Oklahoma were admitted as the 45th and 46th states. The third flag is a modern one. More than eight years ago, when “Your Town and My Town” became a regular weekly feature of “The Suburban,” several of its early columns were based on information assembled by Joseph M. Fronefield, on Wayne as it appeared in the early ’80’s. Mr. Fronefield first came to Wayne in 1881, and established a small drug store in the old Lyceum building, now remodelled into the Colonial building. After his death, the notes were lent to the writer by his son, Joseph M. Fronefield, 3d, as material for this column. Mr. Fronefield also left a large number of books of historic interest and value. Among them are “The Wayside Inns on the Lancaster Roadside between Philadelphia and Lancaster,” written in the early 1900’s by Julius F. Sachse; “In old Pennsylvania,” by Anne Hollingsworth Wharton in 1920, and “Old Trails and Roads in Penn’s Land,” by John Faris, 1927. The book of the greatest local interest is “The Old Main Line,” written by Joseph W. Townsend in 1919, and lent to your columnist in 1950 by Herbert S. Casey, then president of the Radnor Historical Society. Now that seven years have passed since material from this book was used in this column, it seems timely some of the information concerning the now famous Main Line be repeated, particularly since so many new residents have come to this area in recent years. Many questions asked this columnist by newcomers may be answered in this way. Before the Main Line was settled, the Germantown and Chestnut Hill areas had already become favorite places for country residences. Early Philadelphians “who craved country air and more room to breathe” settled north of the city “because the journey by horse or foot to the City from the West and back again involved the sun in the travellers’ eyes both ways.” Indeed it was in the late ’50’s, according to Mr. Townsend, that a “new migration” began beyond the western City Line, and a few city people began to locate along the “Pennsylvania Central Railroad soon after it took over the old Columbia State Road.” The first stop was Mantua, now almost in downtown Philadelphia, while the second was Hestonville, described as a “small village in the midst of farming country.” This was our present 52d street station! Then came City Line Station where the tracks crossed a creek. When a culvert was built for it, the new station was appropriately called “Overbrook.” What remains of the site of the stream parallels the railroad near the station, as the westbound commuter can see. The “Old Lancaster Road” and “The Lancaster Turnpike” pre-date the railroad by many years. The former, later known as Conestoga road, was originally an Indian trail from the Delaware River to the Susquehanna River. Conestoga road, laid out in the 18th century, had in the early 60’s some 67 taverns on it between Philadelphia and Lancaster, or about one a mile. Among these were “The General Wayne” near Merion; the “Red Lion” at Ardmore; the “Old Buck” at Haverford; “The Eagle” at Strafford, and the “Old Ship” near Exton. Whitehall Hotel held about 80 people. Another popular summer place on the Main Line was the Wildgoss Boarding House near Haverford College, which was kept by an elderly lady of that name. Life in that boarding house, as colorfully described by Mr. Townsend, was probably typical of the many summer hotels in the 60’s and 70’s, such as the old Bellevue Hotel and Louella Mansion in Wayne. Next week’s column will be largely devoted to a description of the amusements enjoyed by the young people of the Main Line 80 years and more ago.